SYDNEY, AUSTRALIA — Subscription video on demand (SVOD) services delivered over the Internet continue to feed Australians’ appetite for entertainment with subscriptions reaching 3.7 million at the end of June 2017, a year-on-year increase of 30 per cent, according to a new study by emerging technology analyst firm Telsyte. 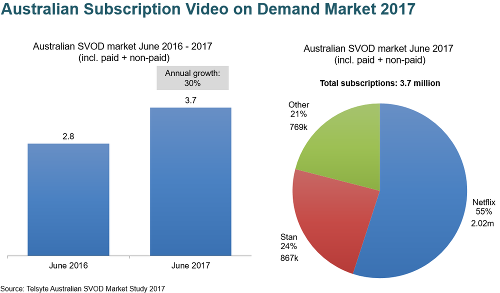 Telsyte’s Australian SVOD Market Study 2017 found almost half (49%) of Australian households currently subscribe to either Pay TV or SVOD services, an increase from 38 percent in 2015. Only 11 percent of households currently have both Pay TV and SVOD. Telsyte predicts paid SVOD subscriptions are on track to overtake traditional Pay TV subscribers by June 2018, as consumers increasingly consume content on-demand, and across multiple devices. Popularity of exclusive and original content, as well as live streaming, is expected to continue to the drive the market to 2021 when subscriptions are expected to exceed 6 million. Telsyte believes consumers will consider multiple providers, leaving room for services from Stan, Amazon, YouTube Red, Foxtel, Optus Sport, and a long list of others to encroach on Netflix’s market leadership. Telsyte estimates that Netflix exceeded 2 million subscriptions at the end of June 2017, with Stan in second with 867 thousand, and others making up 769 thousand. Telsyte research shows that SVOD services are putting pressure on Free to Air TV rivals and traditional Pay TV, with around a third of Pay TV subscribers also having at least one SVOD subscription, and 46 per cent of SVOD subscribers claiming to “rarely” watch FTA TV. Telsyte research shows that the average SVOD subscriber watches nearly 26 hours of video content a week across FTA TV, Pay TV, SVOD, Online TV on demand (Catch up TV & live streaming TV), and other video content sources (incl. non-streaming videos), compared to around 21 hours for the average Australian. “SVOD adoption in Australia has started to reach a scale which has strategic significance to media and telecoms companies alike” Telsyte managing director Foad Fadaghi says. The popularity of unlimited data services on the nbn™ and increases in mobile data caps is fuelling greater SVOD adoption according to Telsyte. On average, Telsyte results show SVOD subscribers typically use 61 per cent more mobile data (3G/4G) than those who do not stream SVOD on smartphones. At the end of 2016, the rate of uptake of SVOD by nbn™ users was 25 per cent higher than non-nbn™ users. “SVOD bundling is an important loyalty driver when mobile and broadband prices are under pressure” Telsyte Senior analyst Alvin Lee says. Services consumption preference including devices, fixed and mobile service.